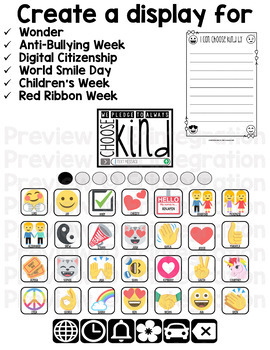 Kindness Emojis editable bulletin board set. 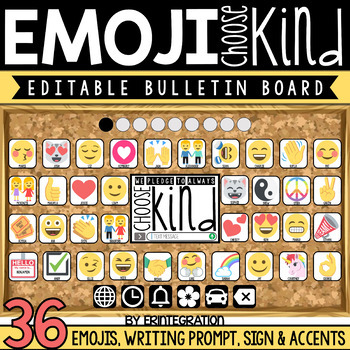 These 36 editable Emoji Kindness bulletin board pieces make a creative bulletin board for the novel Wonder by R.J. Palacio, Kindness Week, Anti-Bullying Week, Digital Citizenship and more. Also includes a "Choose Kind" sign and accent pieces to make your display look like the Emoji Keyboard! Easily add student names right in the PDF file or use your own fonts in the included PowerPoint file. Includes options for 3 displays - one using the included writing or drawing prompt paper. ★ 36 different Emojis to choose from - text is editable in both the included editable 18 page .pdf and an 18 slide PowerPoint file. Emojis are all based on Unicode Emojis and were chosen to reflect a kindness theme. Each editable accent is available with a black border and white background. 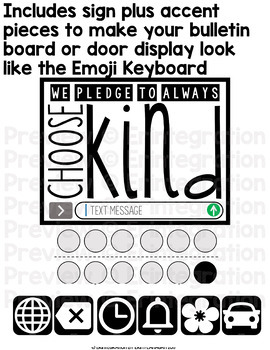 ★ 1 "We Pledge to Always Choose Kind" sign with a "text message" bar. ★ 2 Styles of prompt paper - one with lines and one without (younger students can draw). ★ Directions for editing and assembling the display. 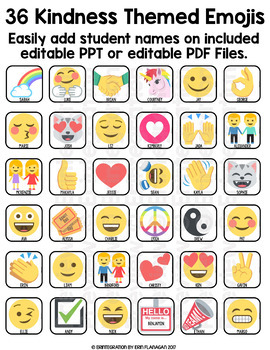 Emoji kindness accents measure approximately 5 x 5 inches and sign is approximately 8.5 x 11 inches when printed as is. This can easily be adjusted smaller when printing.